What is Eukanuba Large Breed Weight Control Dry Dog Food? 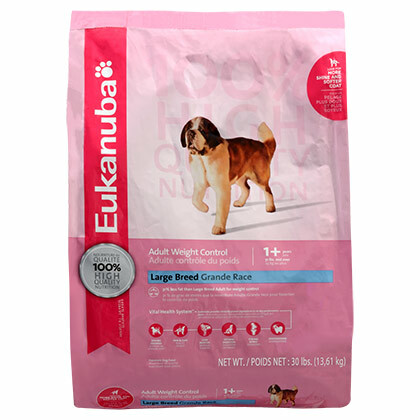 Eukanuba Large Breed Weight Control Dry Dog Food helps overweight large breed adult dogs achieve an ideal weight as well as aids in weight management. This formula is ideal for dogs with lower activity levels and contains L-Carnitine to help naturally burn fat and maintain lean muscle mass. It also contains Glucosamine and Chondroitin to help maintain joint health as well as Omega-3 and Omega-6 fatty acids to promote healthy skin and coat. Eukanuba Large Breed Weight Control Dry Dog Food contains 31% less fat than the original Eukanuba Large Breed Adult formula. The reduced fat formula helps overweight large breed adult dogs achieve an ideal weight as well as aids in weight management. This formula is ideal for dogs with lower activity levels and contains L-Carnitine to help naturally burn fat and maintain lean muscle mass. Ingredients: Corn Meal, Chicken By-Product Meal (Natural source of Chondroitin Sulfate and Glucosamine), Chicken, Ground Whole Grain Sorghum, Ground Whole Grain Barley, Dried Beet Pulp, Chicken Flavor, Fish Meal, Dried Egg Product, Potassium Chloride, Calcium Carbonate, Salt, Flax Meal, Sodium Hexametaphosphate, Fish Oil (preserved with mixed Tocopherols, a source of Vitamin E), Chicken Fat (preserved with mixed Tocopherols, a source of Vitamin E), Fructooligosaccharides, Minerals (Ferrous Sulfate, Zinc Oxide, Manganese Sulfate, Copper Sulfate, Manganous Oxide, Potassium Iodide, Cobalt Carbonate), Brewers Dried Yeast, Choline Chloride, DL-Methionine, Vitamins (Ascorbic Acid, Calcium Pantothenate, Biotin, Thiamine Mononitrate (source of vitamin B1), Vitamin B12 Supplement, Niacin, Riboflavin Supplement (source of vitamin B2), Pyridoxine Hydrochloride (source of vitamin B6), Inositol, Vitamin D3 Supplement, Folic Acid), Vitamin E Supplement, Vitamin A Acetate, L-Carnitine, Beta-Carotene, Citric Acid, Rosemary Extract.